•	Diana Restaurant: International and local specialties accompanied with local and imported wines. •	Lido Tavern: Serves à la carte dishes. •	O’Brien’s Pub and Restaurant: Open for lunch, dinner or to just have a drink in a traditional Irish bar. •	Pool Bar: Serves long coolers, snacks and ice-creams. 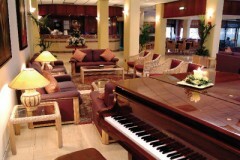 •	Piano Lobby & Terrace: A place to enjoy your favorite drink or cocktail. 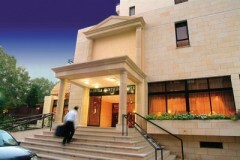 The Kapetanios Odyssia hotel offers two conference rooms. The Athena Conference Room is designed and fully equipped for conferences up to 300 delegates, and Othellos can accommodate up to 170 delegates. 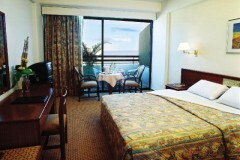 The hotel can provide a simultaneous interpretation system, and audio-visual equipment. The hotel offers an outdoor swimming pool, a children’s pool, Health Club and Spa, Massage, Sauna and Jacuzzi.